Twitter/Fox NewsDonald Trump during a June 28 speech in Pennsylvania. Donald Trump just delivered a major economic policy speech at a factory in Pennsylvania. But while the location was intended to convey the real-estate mogul’s seriousness about revitalizing American manufacturing industries, observers were at first a bit distracted by the backdrop that was directly behind Trump. 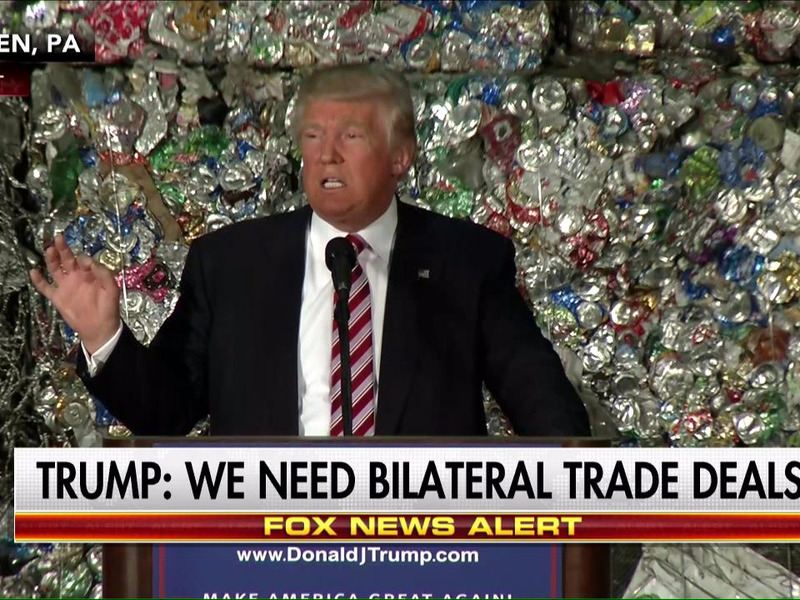 Indeed, for over a half an hour, Trump spoke at length about his protectionist trade policies while perched in front of several compacted blocks of trash, which took up much of the screen on the major cable networks that carried the speech. Observers on Twitter were quick to point out the bizarre staging. Staffer 1: So just whatever you do, don’t put him in front of a giant pile of garbage. Well what message do we want the setting to communicate to voters? Some observers saw some parallels to Trump’s plan to build a wall along the Southern US border.